A flash of scarlet red will illuminate any look. 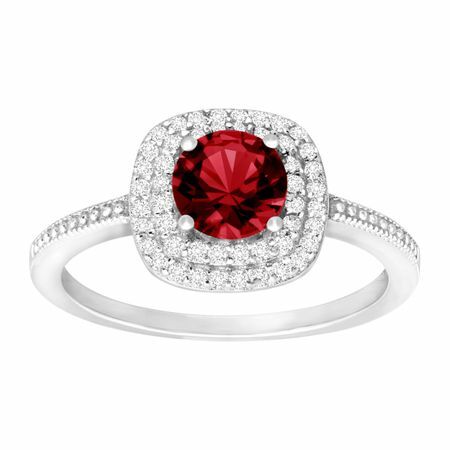 A 1 ct round-cut created ruby is haloed by sparkling cubic zirconia totaling 1/3 ct are set in a gleaming sterling silver band. Ring face measures 3/8 by 3/8 inches. Please scroll down to see similar pieces. We're sorry, this product is currently out of stock. Price currently unavailable. Please customize to another option. This item qualifies for Free Shipping and is covered by our 30-Day Zero-Hassle Return Policy. Full details here.